The ninth-generation F-Series trucks added an aero element to the smooth redesign of the previous model, making it one of the more popular trucks among late-model F-Series enthusiasts. Interiors for 1992 were familiar yet different, with updated instrumentation inside a sleek new dash, redesigned seats, fresh interior trim, and the first separate power point plug to grace the F-Series. Though it retained an unmistakable truck feel, this rounded, refined interior set Ford trucks apart from the blocky designs of the competition. Exterior treatments were equally impressive; a rounded front-end facelift punctuated by a new grille and wrap around headlights gave the F-Series a very sleek look. Different bumpers, a revised tailgate, new "aero" mirrors (only on the F-150), body side moldings and single piece windows on Super Cab models completed the ninth-generation F-Series redesign. Here's a video tour of a truck. I encourage you to take a few minutes right now to check this truck out! The 1992 F-Series offered three specific trim levels-Custom, XL, and the top-of-the-line XLT, which featured full power equipment, including seats and lumbar for trucks equipped with captains chairs. The key dimensions and powertrain options carried over from the previous-generation trucks; F-150s utilized the 4.9L, 145 horsepower I-6 as standard, with either a 185-horsepower 5.0L or 210-horsepower 5.8L V-8 as optional equipment. Those engines were also available on the F-250, along with the venerable 7.5L (460 cubic inch) gasoline V-8 making 230 horsepower and 390 lb-ft of torque, or the 7.3L (445 cubic inch) diesel V-8 pumping out 185 horsepower and 360 lb-ft of torque. A turbocharged version of the 7.3L diesel was available late in the 1992 model year (sometimes referred to as a 1992.5) that added 5 horsepower and 30 lb-ft of torque. Transmission options ranged from the C6 3-speed auto, to a 4-speed auto, 4-speed manual and a 5-speed manual. All trucks came standard with rear anti-lock brakes. F-Series trucks were offered in Regular Cab, Super Cab, and Crew Cab designs with either a 6 or 8 foot styleside box. 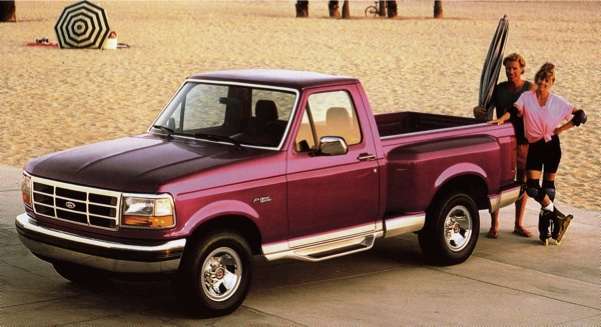 Returning to the F-150 lineup for 1992 was also a short bed Flareside model, which had been absent since 1987. The Flareside was marketed as a "truck with a personality as unique as yours," offering buyers a choice of two or four-wheel drive in either regular or Super cab format. Flaresides came standard with XLT trim and offered molded side steps along with a unique rear bumper. Six color options were available for the Flareside, including the Flareside-exclusive Iris Clearcoat. The special-edition Nite F150 package, which debuted for the 1991 model year, continued through 1992 and was offered on all body styles, including the Flareside. The Nite package was only offered in Raven Black with unique striping, and featured the 5.0 liter V-8 as the standard engine.1992 would be the last year for this package. Rusty oil pans and finicky transmissions continue to be problems for this generation of the F-Series. Specific F-150 recalls include the parking brake (ID# 44785), door latch release (ID # 34812), and the fuel pump check valve (ID# 24716). Despite these issues, owners generally have favorable reports for the reliability, longevity, and functionality of these trucks. Approximately 500,000 F-Series trucks were sold in the 1992 model year, with MSRPs ranging from around $10,000 for a base F-150 Custom, to well over $20,000 for a loaded F-350 crew cab.